Might the Gaming World forgive me? May my sins be absolved? In my youth, I was foolish fool of fools. In my haste, and childish recklessness, I made a grave error: I sold my copy of The Orange Box less than two weeks after purchase. Please! Hold your chastisements for a moment, dear merciful reader. Allow me to repent, before judgement is passed. As with most games I play, I arrived late to this soiree. I must admit that I had yet to play Half Life 2 by the release of the collection. I bought The Orange Box in 2009 – the last year of university – on the recommendations of countless, honourable gamers. I’d been told how good the Half Life games were. (Yes, I had not played Half Life 1 at this point either; the scroll of my misdeeds will only continue to unravel.) I had also heard hearty praise of Portal and Team Fortress 2, and was anxious to share in the collective ecstasy. So the Box arrived. I played Half Life 2. I then played Half-Life 2: Episode 1. And then I played Half-Life 2: Episode 2. Once I was done… I had little feeling towards the whole experience. I hadn’t spotted what all the fuss was about. To the dismay of my adult self, I mentally shelved my memories of the experience into an alcove marked “Video Games: good, but not great”. Now before a cavalcade of keyboards crash against a multitude of monitors in righteous rage, I must emphasise that I did not dislike my first playthrough of Half Life 2 and its extra bits. The gameplay seemed entirely competent, the atmosphere was right, and there was a visual appeal there. Whilst the story was wild and wonderful sci-fi, I was less than invested. I liked Alyx Vance – for both honourable and less-than-honourable reasons – and felt that she brought some motivation to proceedings. Nevertheless, most characters came across as superfluous, and it rarely seemed clear where I was going or why. There were lots of nice locations and variety in weapons and vehicles, but it all seemed like lots of pieces that had been mashed together. If there was a narrative, my ignorant mind had found it wanting. The gunplay was solid, and the enemies original, but I couldn’t see exactly why this was such a momentous series. Such a moron I was. Yet the extent of my accursedness has yet to be fully revealed; the ragged, dirt-ridden curtain has been only half drawn to reveal the full monstrosity that is to be my damnation. 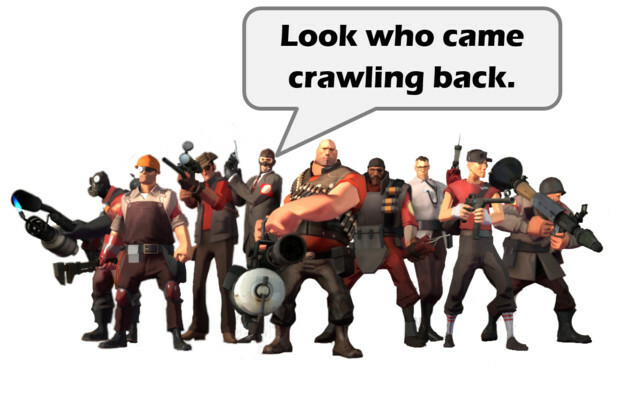 As the credits fell on Episode 2, with the absolute feeling that I had gathered all enjoyment that I could from Half Life, I wheeled to face Team Fortress 2. Multiplayer games have never been my strong suit, but I had enjoyed a handful in the past. You see, I lack the competitive streak of a good online gamer. If I’m to play alongside others, I would rather play alongside them. A cooperative video game will always trump the competitive variety. The inclusion of a ‘Team Deathmatch’ mode isn’t a guarantee of my support; you’re not really working in a ‘team’, there are just people you don’t have to shoot at. Regardless, I was willing to give the next item in The Box a chance to entertain. I didn’t…really…give it much of a chance. I played no more than four and a half matches. The ‘half’ was the last match. In my idle lunacy, I dismissed TF2 as ‘just another multiplayer’. Another ridiculous blunder on my part. To my younger, idiotic senses the game had a great visual appeal, and clearly wasn’t about to take itself too seriously. However, the few games I had enjoyed had kept me coming back by employing a feel of progression. 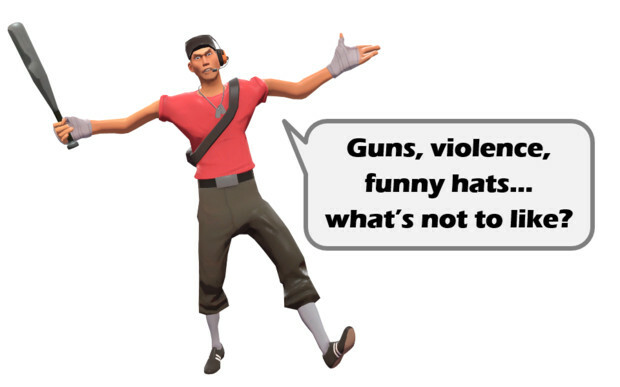 I was comfortable with games that drip-feed the content – gain enough experience, unlock the next class of warrior or weapon – but in Team Fortress it was all already there, on a plate. 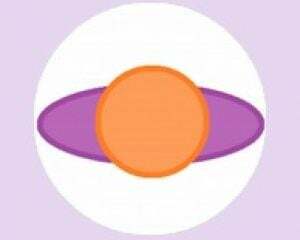 With no past experience, I had no understanding of how the classes differed, how I should play, or why I should care. 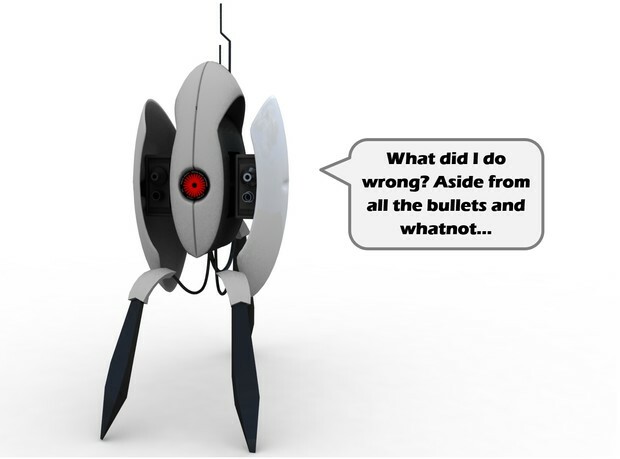 As if matters could not get any worse, we turn to the final game in the set, and perhaps my greatest moment of imbecility: I played Portal… and decided that it was only ‘very good’. So with each game given a brisk and unfair overview I was idiotically convinced that The Orange Box had performed admirably, but at a standard that could only reach up towards my high expectations. So the collection was promptly dismissed; sold without remorse. May the Gaming Deities have mercy. Last year, I purchased Half Life 1. There were a few reasons for this. Firstly, it was cheap. Secondly, my aging laptop needed something less challenging, as games produced in the last five years tended to leave it weaving and dizzy. Thirdly… I’m a console gamer by default, so all the games I was most interested in were on the PS3 or 360. Even after purchase, the game sat alone, unwanted, not even able to gather dust inside the virtual library. This Christmas, I purchased a new PC, and my gaming options expanded. I bought myself a few new games, but as I glanced over my older collection on Steam, I realised that there were a few games that I should really play if I was to justify the new editions. So I dutifully, and a little begrudgingly, opened Half-Life 1. A few weeks passed, and realisation began to brew and boil. I gradually began to realise that my dismissal of The Orange Box have been a mistake. I’d dip in and out of the game at first, playing an hour or so when I had time and between other games. I then played the second half without interruption from any other media. I’d found the experience increasingly entertaining, and was compelled to re-buy The Orange Box last week, this time on PC. I was about to realise what a fool I had been. 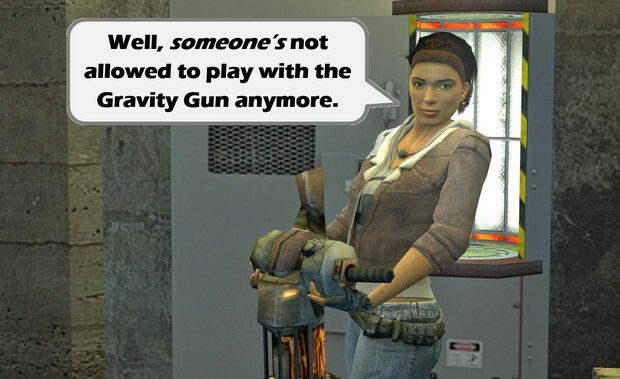 When I first played Half Life 2, I had snubbed the story. To me, back then, it had felt like there wasn’t much of a coherent narrative. There were lots of ‘chunks’ of very good gameplay, with a larger story hanging around in the background. Fragments of narrative, if you will. Now that I’m older, I see that this is actually a strength rather than a weakness. 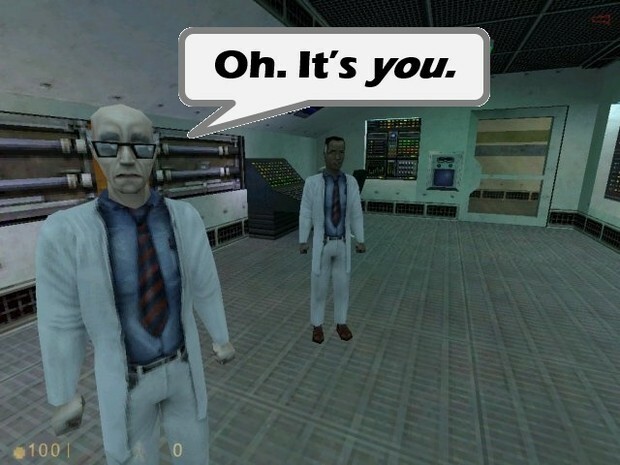 Most games place the protagonist at the heart of every element of the story, but in Half Life the story is bigger and deeper than Gordon Freeman. A lot of importance is placed on him, but in the end he’s another human scrambling around trying to piece it all together. Once I saw the game this way, the randomness of the set pieces – the fliting from stealthier, creepier sections back to full-on action – all makes much more sense. I’m almost through Half Life 2 for the second time, and I’m absolutely smitten. The story, the visuals, the brief snippets of excellent human characters, the subtle humour and the darker corners of the story are all parts that I adore. I find myself more invested too: I give a little jump each time an unseen head crab pounces. I find myself looking round for every nook and cranny that might be explored. With each new encounter I find myself trying to imagine Gordon Freeman’s thoughts on all this. You know, apart from all the internal screaming that must going on inside that big brain of his. I appreciate the little things as well now. I love the way the weapons stack up on the number keys. In a moment of panic I hit the mouse wheel or number keys one too many times, causing Freeman to juggle through his inventory so that he appears to mirror my own anxiety. I appreciate how few enemy types and available weapons there are at first. The introduction of each new feature carries some quietly implied importance. The world too, that gorgeous world that shows better than most how dystopia can be incredibly fascinating. 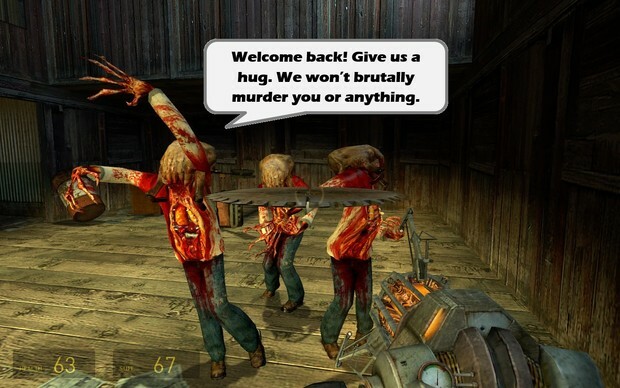 More than anything, playing Half Life 1 has allowed me to see just how far Valve moved things forward. The difference between the two games is staggering in many ways. The amount of thought gone into improving on the prequel is self-evident. No one was resting on their laurels; so much of the old game is replaced, enhanced or improved to make the experience as awesome as it can be. I could go on, but that’s not why I’m here. 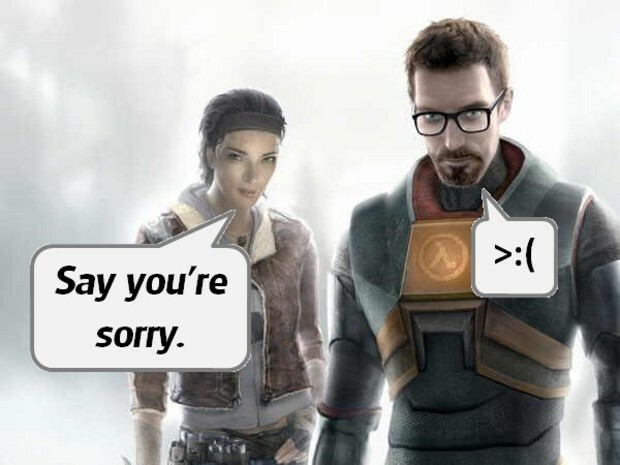 Convincing you that Half Life is a great series would be like trying to tell a baker about the merits of bread cutting. No, we’re here because an idiot gamer has realised the error of their ways. I haven’t yet approached Episodes 1 and 2, but I have already begun to look back on the decisions my younger self has made with the serious contempt. However, my self-induced humiliation does not stop there. With a new-found affection for one element of The Orange Box, I decided I should devote some time to what had been my least favourite segment: the multiplayer. If I could enjoy Half Life this much more than I once did, could it be possible that Team Fortress 2 could also provide some thrill? I seriously doubted it. I’d heard about different maps and game modes that I hadn’t credited the game with, (they added Hookshots recently, sounds like fun) but competitive multiplayer has to go a long way to draw me in. Wait…… Huh. Why does that say “Play co-op”? What…...what’s “Mann vs. Machine”? Does this game have co-op mode? I think this game has a co-op mode! When did this game get co-op mode?? Suddenly, the moronic man-child of my past looked all the more ridiculous. Sure, this feature wasn’t there when I bought the game, but if I had given The Orange Box the love and care it deserves, then I could have been playing cooperative TF2 for the last two years! Even now I’ve only played a few rounds, but I already know that it’s exactly the kind of multiplayer I can get behind. Someone hand me a crowbar and a time machine. Someone’s got to go teach me a lesson! There is then, one other part of The Orange Box left without a revisit. And you know what? I’m not sure I deserve it. Portal was my favourite part of the collection, but I still threw it out with the rest (of what I now know is an incredible set of games). I gave that superb video game the cold shoulder for finishing “too early”. I looked that gift horse in the mouth, poked at its teeth, and then sent it to the glue factory. 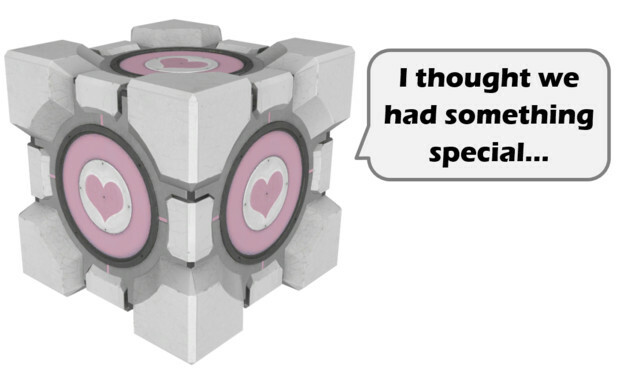 If I do go back to see the Companion Cube again, it will be with flowers, wine, chocolate, and the promise of some real quality time. I’ve got two things to ask you lovely commenters this week. Firstly, have you ever found yourself in a similar situation? Have you ever rejected a game, only to return to rediscover and enjoy the experience? Are there games you hated, but on closer inspection realised you want to be their friend after all? You can contact me on Twitter @RedHeadPeak or visit GamerPeak.com to read more.